After summer cycling in fingerless gloves I always get a shock when I get that first really cold commute in the winter. You know the one where the temperature feels chilly but not too bad, but then you get out on the bike and it rains a little and you get gale force winds and you find out later that including wind chill factor it was 10 below freezing? Well I decided to treat myself to some proper winter cycling gloves this year. I was looking for windproof and waterproof gloves because of Irish weather. Decent padding would be a bonus! After using these for a couple of weeks, including some torrential rain, but only limited mileage I have a decent first impression. The gloves are windproof, no question. Waterproof? I don’t think so. Do they mean water resistant? These are not very waterproof gloves. I was concerned with a slight feeling of dampness after only a few miles. These gloves are not waterproof as claimed but they will keep your hands warm in rain. Other positives… these gloves are very, very light. You wouldn’t believe it to look at them. I didn’t see a listed weight, but my fingerless summer gloves are heavier by far. The reflective trim… as a commuter I really appreciate this. I love giving motorists good visibility where they can properly see my hand signals and know I’ll be turning ahead of them. These gloves are great for this, the trim looks really good. 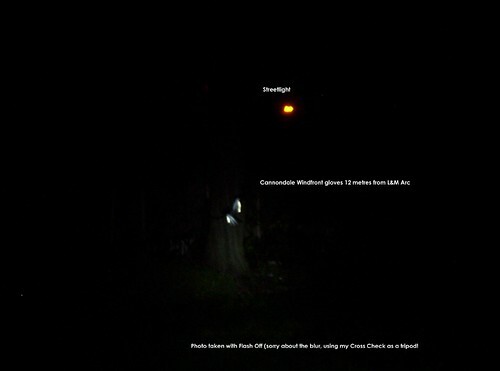 Check out the photo above – that was taken in pitch black conditions with flash and you can partially see how reflective they can be. To really show the full reflectiveness I need to take a distance photo which I will do sometime, maybe when I’m updating this review post later in the season. Two things motivated me to update this review so quickly – first of all, BruceW tells us he bought some Windfront gloves after reading my review – I sure hope they work out and I abdicate all responsibility if they don’t 🙂 Ah no, I’ll buy you a pint if you’re ever in town, fair enough? By the way, how much did they cost? I think this does a half-decent job of showing their reflectiveness. It’s not the best in the world, but it’s handy to have along with the other positive factors and good price it serves to make this a good choice for commuters in mild winter areas like Ireland. Snow riders apply elsewhere, you crazy people! I’m fortunate that I didn’t have to purchase them on your recommendation alone, so you’re off the hook for the guilt. (But I’ll take that pint if I’m ever in the neighborhood!) I checked them out and decided for myself that they seem pretty good. I’ll have the chance to try them out over the coming weekend when they’re calling for snow and below-freezing temps.. They cost US$39.99 at the LBS. The shop was having a winter gear sale where the second item was 20% off, so I saved US$8.00 there. Plus my 10% bike club discount covers a shade more than our 8Â¼% sales tax. Sweet – cheaper here than the States – that’s damn rare! The reason I’m abdicating my guilt is not the quality of the gloves 🙂 What it is, is that I know you’re going to be dealing with a lot colder weather than I. The worst we’ll see this winter is -4 to -10 celcius, and that’ll happen for a week or two at most. What we do have to deal with is as much rain as Seattle, and serious amounts of wind. Living on the coast rules, but why is it a headwind in the morning on the way to work, and then a headwind on the way home? Anyway I think they’ll serve you well, enjoy! We introduce ourselves to you as an old, established and well-experienced manufacturers and exporters in Pakistan for the following range of Products. We have our own Tannery Unit and Production Unit and given such up-to-date manufacturing arrangements, our qualities are authentic, durable and fast-selling in an international market . Please submit us any enquiries for the following items so that we may send you our Catalogue Pictures with best competitive export prices for your study and selection. SUMMER MOTORBIKE GLOVES, MOTOCROSS GLOVES, CYCLING GLOVES, CROSS COUNTRY GLOVES, NEOPRENE GLOVES, FLEECE GLOVES AND LEATHER GARMENTS etc. If you needs any thing, please feel free to contact us, we assure you that we will supply you the best quality products at extremely reasonable prices. Yours prompt reply would be highly appereciated.